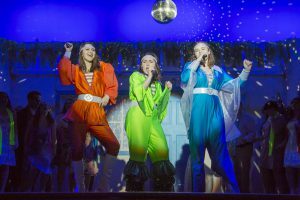 The Warwick Valley High School Drama Club presented Mamma Mia! in March, selling out performances of this sunny and funny musical. The cast included over 60 students with an additional 20 working on stage crew. The production was directed by Nick DiLeo, who is celebrating his 20th anniversary as Drama Club advisor. Joining him were Donna Nestor as producer, Beth Maisonet as choreographer, and Chris Persad and Noreen Hanson as musical directors. See more Mamma Mia! photos on the Warwick Valley School District Facebook page.